When you peek at the back of a shaving cream can, you may notice a longer list of ingredients than the processed food in the grocery store. Almost all of the ingredients are unpronounceable, and really a bit scary when you think of what impact those ingredients have on our bodies once they are absorbed into our skin. My husband has been searching for a good shave soap for years now and he continued to come up empty handed. He has very sensitive skin and couldn’t seem to locate anything that worked, didn’t contain a ton of chemicals, and didn’t irritate his skin. So, like many other things in our life, we decided to try our hand at making our own. My hubby has been extremely happy with how these products turned out, and he uses them on a daily basis, confident in the fact that toxins are not leaching into his system, and he does’t have to worry about skin irritation issues. Mix the olive oil and caster oil in a medium bowl. Then, slowly mix in the three essential oils. Using a funnel, pour the shave oil into the amber bottles. Cap. Enjoy. Fill the pot or saucepan half full with water. Bring to a simmer. Place the glass bowl in the pot of water to create a double boiler of sorts. Place the melt and pour soap base in the glass bowl. Stir the base with a wooden spoon until it melts. Remove the bowl from the heat and quickly mix in the clay. Then add the three essential oils and stir. Allow the mixture to cool just slightly (enough to thicken the mixture just a bit). Pour into your molds. Allow to rest until completely cool. Remove the soap from the molds. Enjoy. This entry was posted in DIY, Holistic Living, Recipe, Sustainable Living and tagged bay, bay essential oil, cedarwood, cedarwood essential oil, DIY, eco friendly, holistic, holistic living, home, homemade, homemade shave oil, homemade shave soap, homemade soap, homemade soap making, homemaker, homemaking, make, making, mama, mindfulness, mom, mother, organic, recipe, sandalwood, sandalwood essential oil, shave oil, shave soap, sustainable, sustainable living. Bookmark the permalink. WOW…you are just amazing! I know who to call when I find something I really can’t find! Just a question…..the soap base link shows ingredients of Sodium Lauryl Sulfate and Triethanolamine. Wouldn’t the melt and pore shave soap base at Bramble Berry be in a better choice if you are trying to chemicals like SLS? Great question Justin. I did purchase the linked soap base with the knowledge it contained SLS. Unfortunately, it was the best option I had at the time I purchased the soap base. I am currently looking for other options, including making my own lye and going that route. I will look into the melt and pore shave soap base you mentioned as well. Thank you for the recommendation! Be sure to let us know how things turn out. Unfortunately, all soaps, including melt and pour bases as well as hand crafted soap bases include lye (Sodium Lauryl Sulfate). It’s the cleansing agent. Lye is actually sodium hydroxide. Technically, soap can be made without sodium hydroxide but it will usually be substituted with potassium hydroxide. The cleansing agent in soap is the results of a reaction between sodium hydroxide/potassium hydroxide and a fatty acid (oil, fat, etc. ). The SLS and SLES are artificial chemicals that are used to create an artificial high level of sudsing. It is quite possible to have soap without SLS. Not only is it possible to have soap without SLS, but any product with SLS should not be labeled as a “soap” as SLS qualifies as a detergent (even though it is derived from organic components.) Once you add detergents, they are supposed to be labeled as “beauty bars” or “bath bars,” not a pure soap. Don’t try to make your own lye (from wood ash), too time consuming, and strengths vary. Buy lye, make your own soap. Lye can be found fairly easily. Brambleberry does indeed have several Melt and Pour (not pore) soaps without any SLS. Give them a try! Home made soap can be rebatched, not quite as easy as a melt and pour but same concept. I plan on making my own pre-shave based on your instructions. How did you come up with the amount of essential oils that you use? Did you experiment? Also, where did you buy your labels and did you print them on your printer? I think that they look great!! Another question…how many 4oz bottles did you fill with your formula above? I want to order bottles but want to make sure that I order enough of them. I played around with the ratio of essential oils I used. My husband was a good test subject 🙂 I used Avery labels and then printed them on my printer. You can download free templates from the Avery website. (I link to the Avery website and the labels I used in this post.) 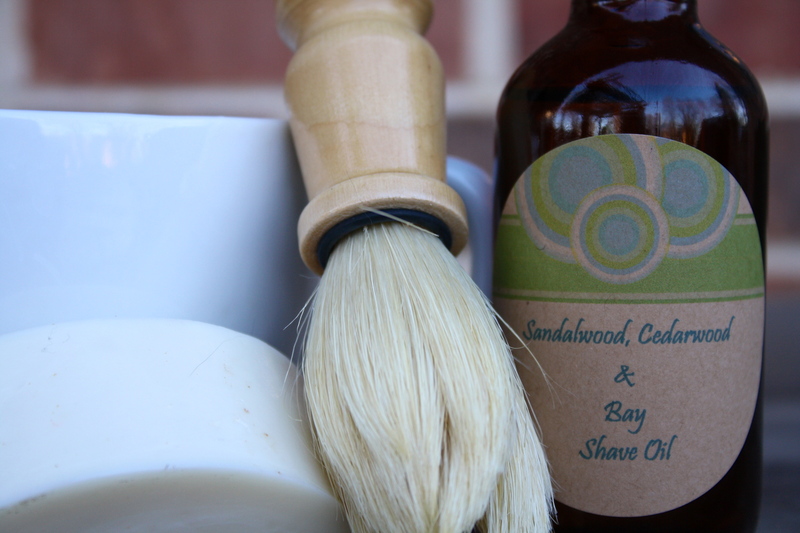 And if I remember correctly, I filled three 4 oz bottles with each batch of the shave oil. Good luck! Thanks, Jaime…I’ll buy the “six-pack” of bottles from the site that you recommended. 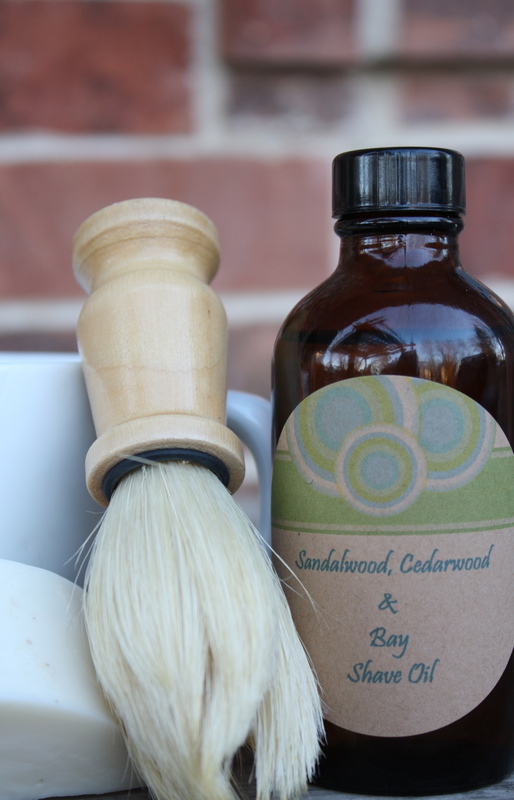 I’ve just read about Sandalwood being an endangered tree and that many companies selling Sandalwood essential oils aren’t really selling the “real thing”. Any thoughts? Quick question, just made a batch of the shaving soap but found the clay powder really difficult to mix in, any suggestions? I don’t remember having trouble with the clay, however, I do remember mixing the clay in very quickly when the soap mixture was still very hot. I then kept stirring it until the mixture started to thicken up slightly, and poured it into the molds. New directions has melt and pour that is SLS free.